Here are the builds of onscripter for iPhone/iPod Touch (latest version). I’ve tested them with OS 4.0.1 (not sure if it still works with 3.1.x, if someone still has that please test). Report any problems you might find by commenting below. I’ve made two builds, a normal onscripter and one that works for Tsukihime (so replace the files from my Tsukihime tutorial if you want to play it on iOS4, make sure you edit Info.plist and SDLAppParam.plist – see comment below). Please give credits if you use these in any games that you might port. I’m having the same issue on 4.0.1 on an iphone 3G. goes black then closes. And make sure you chmod your onscripter binary to 755. What exactly is the SDLAppParam.plist and the CFBundleIdentifier iVN.onscripter.GameName? Before it crashes, do you see a set of buttons on the side? And you have changed Info.plist and SDLAppParam.plist right? No I don’t see them. And yes I’ve changed Info.plist and SDLAppParam.plist. That means it hasn’t found the script files, have you followed every single instruction correctly? The path in SDLAppParams.plist points to the path where your game files are right? (which contains nscript.dat). 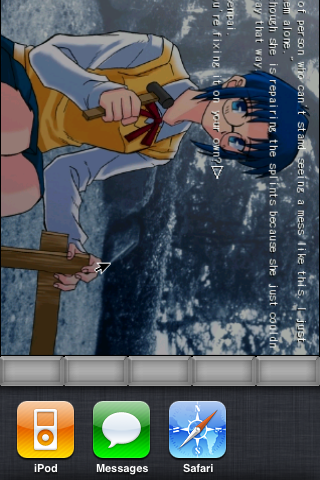 Installed Tsukihime and currently playing it 😀 thanks 0neoc. Are you going to make a guide on how to do this with other VNs? or are you going to make those yourself? As for the guides, I’ll probably write something to automatically convert games later. Still no way to label them buttons? If you want to, I can. But is it really necessary? The labels would also have to fit in that little space and may looked really small/cramped/crap. I’ve got a problem. Whenever I try to save, the game crashes. how do I fix that? nevermind I fixed the problem. I had copied a complete global.sav of tsukihime but it wasn’t chmodded. had to do that step again. 1) Certain visual effects (fading etc.) are significantly slower on my iPod than on my computer. I guess this is just because I have an old slow gen 1 iPod touch and not a fancy iPhone 4 or something. 2) The engine can’t seem to handle color-coded text. I’m testing with an onscripter game called “The Noose”, and where it is supposed to display red text, it shows “#FF0000 blablabla text text dialog bla bla bla”. I haven’t tested it with Umineko or anything (which obviously contains colored text), but can anyone confirm whether or not they have seen this engine display colored text in any game properly? It is possible that this particular game uses a different method for coloring than usual, and that that method isn’t implemented in this version of the engine. It DOES, however, work fine on the PC version of Onscripter. Oh, I’m an idiot, I forgot one more thing: Wordwrapping. Also, is there any way to change the resolution at which onscripter runs? Right now, it automatically runs as if it were 640×480, and then scales down to the resolution defined in SDLAppParam.plist (as far as I can tell, anyway…), which is great for running games designed to work in 640×480, but there are already a lot of games that have been converted to lower resolutions for running on the PSP and such. In those games, the images have already been downscaled lower than 480p, so it would be convenient and more resource-efficient if there was a way I could tell onscipter to run at my iPod’s native res (or lower and scale up), rather than have it run at 480p all the time and have to scale down the images (which is, I assume, what is making it so slow). It does not handle color text as it is not onscripter-en, the fork specifically made for English games, but rather the original Japanese onscripter that has been compiled with the option of displaying English characters. This is the same reason for why there is no wordwrapping. I’ll try to fix this later. As for the resolution the best way would be to just use sarconv and nsaconv to scale the images in *.sar and *.nsa archives used by the games. Very weird, when does this error pop up? And the install folder where you have Tsukihime installed contains the mirror moon 1.2 patch right? yes, it has patch 1.2, it happens around a minute after I run the program. I think it is a problem with my converter. I’ll try to fix this soon as I’ll make something generic that can convert all onscripter novels. You have to change the font size in the script. And from what I remember it was quite tedious, not too sure as it was a long time ago. Also, from what I remember the save files seem to keep the old font size even after you change it, although I think it goes back to the one in the script after a while (this caused quite a bit of frustration for me as I didn’t know this). Any way to get ‘native’ support for the higher-resolution display (i refuse to call it ‘retina’) on the iphone 4? I got Tsukihime to work, but there are a couple of problems likely related to the increased resolution — first, all the images and text has a distinct lack of detail and is poorly filtered to display on the higher resolution. I presume iOS is doing this automatically. Second, the buttons on the right side don’t show up properly; in the spot where the top button would be, there appears to be two button-bottom-halves, and the rest of the button ‘bar’ has no buttons. Also, text shadow appears to be missing in a number of spots. Particularly, during the intro, when the background shows the moon very large, bits of text lack shadows and are completely unreadable. Works perfectly!! thanks man, you’re awesome! ^^, would you do some day the visual novel of Fate? I’ve seen the Japanese people already have it, but only in japanese xD, I hope you can do it some day ^^. Will you work on a version for 4.3.3 too? can this works on ios5 ? Hoping to find out the same. I tried running Umineko on iOS 5.1.1, but had no luck with it. Also trying to get this to work on 5.1.1, anyone have any success?